3R — Range & Resource Rights Symposium — Layton Utah | RANGEfire! 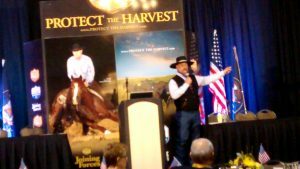 On May 20-21, 2016, Protect the Harvest and the National Federal Lands Conference sponsored a Range & Resource Rights Symposiion in Layton, Utah, emceed by Trent Loos of Loos Tails and Rural Routes fame. Instead of attempting to summarize everything that happened at the symposium, we’re waiting for the videos of the speakers and presentations, to post links here. On Friday, there were resource presentations on timber, mining, wildlife and wild horses, as well as grazing. Cliff Gardner and Hank Vogler talked about a variety of challenges facing Western ranchers, including federal overreach, wildlife and endangered species issues. Ramona Hage Morrison gave the dinner speech on Friday evening, talking about the Hage case and the Hage family’s experiences in ranching and in the court system, followed by cowboy poetry entertainment with Waddie Mitchell. On Saturday, attorney speakers started out with Gary Baise, followed by Terry Padilla, an attorney who serves as chief grazing officer for the U.S. Forest Service’s regional office in Ogden, Utah, presented the federal government perspective. The local government perspective was presented by Commissioner Demar Dahl, from Elko County, Nevada. They were followed by Dr. Angus McIntosh addressing the topic of “range rights,” and keynote speaker Bill Norton from the Center for Self Governance, addressing the basic, fundamental principles of property rights. More attorneys rounded out the day, with a panel discussion on legal options, including litigation, coordination and other options, with Blair Dunn, Todd Macfarlane, and Chuck Miller. Organizers had been hoping to have Idaho Attorney Fred Kelly Grant join the panel to talk about coordination, but unforeseen health issues prevented his attendence. We wish Fred a full and speedy recovery. It is anticipated that in addition to videos of the presentations, there will be upcoming repeats of the symposium in venues like Albuqurque, NM and Omaha, NE. Stay tuned.